Laser Beak Man is a triumph on so many levels. The mute titular superhero is the creation of Tim Sharp, diagnosed with autism at age three (now twenty-nine). His mum, Judy Sharp (Associate Producer), refused to believe advice from the experts – that her son would never speak or emote – igniting instead of ignoring, his passion for drawing. Sharp’s colourful world eventually became an 8-episode animated television series and now, thanks to David Morton and Nicholas Paine, the brains behind the award winning Dead Puppet Society, in close collaboration with NYC’s New Victory Theater, a 90-minute vivid and heartwarming stage show. Known for their acclaimed productions incorporating beautifully realised puppets (The Wider Earth, Argus and The Harbinger), Morton and Paine collaborated with Sharp and Sam Cromack of Brisbane indie band Ball Park Music (Daniel Hanson, Dean Hanson and Luke Moseley). Sharp’s hilarious visual puns paired with Cromack’s original compositions, slightly reminiscent of the Beatles, create the technicolour world of Laser Beak Man, complete with the first free-flying Air-Orbs in the history of Australian theatre. One seems evil, like a Big Brother eye, and the other a friendlier vessel, for escaping and venturing off into the world. For Brisbane Festival and La Boite to premiere this family friendly, wholly entertaining and life affirming production is a coup. 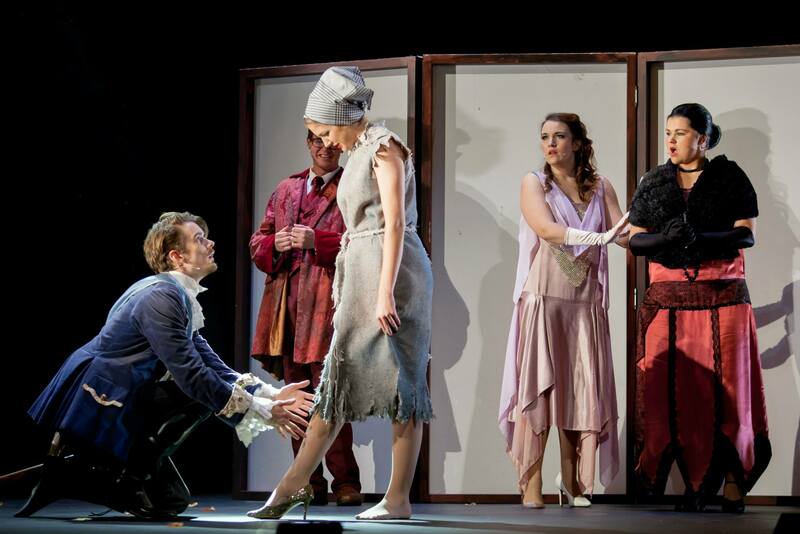 The show is deceptively small and dark to start, contained within a black box built high on stage in the traditional orientation, without a hint of colour or drama or finesse. But suddenly, as the plot demands, the black is whisked away and like waking up in Oz, or stepping into Willy Wonka’s chocolate room, we’re treated to the digital visual spectacle of Laser Beak Man’s Power City (Design Jonathan Oxlade & Projection Design Justin Harrison with Sound by Tony Brumpton and Lighting by Jason Glenwright). So the premise is a simple superhero story – Laser Beak Man and his friends must work together to overcome evil and save the world! – but the visual splendour and the cheeky characters inhabiting this place (and the talented artists who bring them to life on stage) are simply extraordinary. The cast comprises Nathaniel P. Claridad, Jeremy Neideck, Lauren Jackson, Jon Riddleberger, Betsy Rosen, Helen Stephens and Maren Searle, with a special guest appearance from Leigh Sales, her pre-recorded voice and her animated likeness anyway, as the Reporter. There’s not a weak link among them, and in a superior display of collective skill and connection, there are often up to three or four ensemble members manipulating a single puppet. The script bubbles over with lovely silly comedy and some of our favourite puns include a series of terribly funny tomato puns, including the slightly vain hope after several minutes of them, that the projection designer doesn’t run out of tomato puns! Poppy forgets to continue reading the captions sliding by beneath the action and when I tell her later she laughs. She says, IT’S A KIDS’ SHOW BUT IT’S FOR ADULTS! There’s really something for everyone: while its innocence is refreshing, and totally fine for the kids (recommended for 8+), there are plenty of political references for the millennials and parentals. Laser Beak Man, a Brisbane Festival highlight, is a delight for all the family, full of joy and optimism, and very obviously originating from the simple goodness of genuine hearts able and willing to turn their creative talents / superpowers into making the world a better place through good old fashioned high-tech theatrical storytelling. Poppy and I fell in love with little Argus in 2013 at Brisbane Powerhouse, where the show was the humble highlight of their PowerKids festival. You can read our original review, which reveals a little more of the story, here. You know the feeling that flutters up from somewhere, tickles your heart and the tip of your nose, and bursts into a million bright yellow butterflies when you come across an old favourite toy or a ribbon bound bunch of love letters in the bottom of the box of special things stashed under your bed? THAT’S ARGUS. It’s a gorgeous show, full of every emotion and offering the perfect solutions to global problems of displacement and loss. LOVE. AND LOOKING OUT FOR EACH OTHER. WHO WOULD’VE THOUGHT? It’s an ancient story made new by the simple retelling of it. A little guy – Argus – loses his friends and travels the world to locate them. Through his bright eyes we see how big and frightening and wonderful and awesome our world is. There are physical, emotional and ethical challenges – and big, loud, egotistical evil dudes wielding red spades – but there is joy in something as simple as a tiny flower and in the acts of sharing, and giving and receiving simple gifts. Nathan Booth, Laura Hague, Matthew Seery and Anna Straker make an impressive ensemble, bringing to life every character with a deceptively simple arrangement of hands, voices and recycled kitchen things. It’s extraordinary to look away from the illusion, magically lit by Jason Glenwright, to watch four expressive faces, another entire performance happening above the performance space. 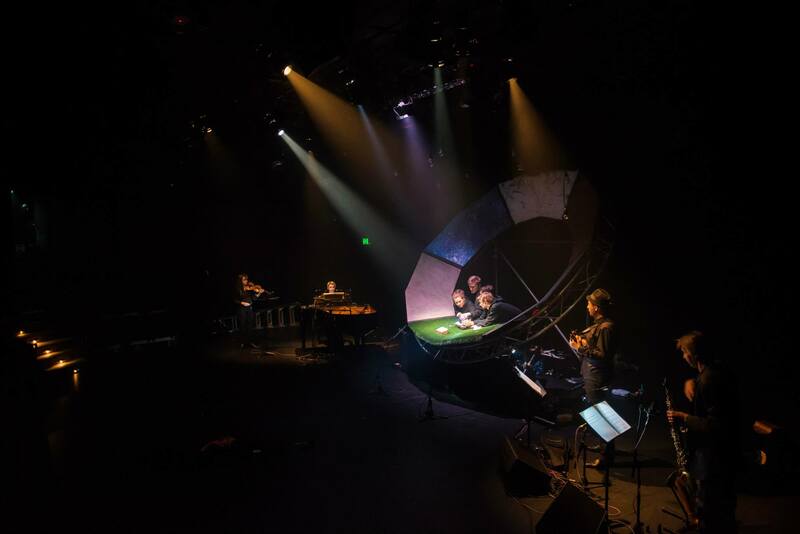 Director and Designer, David Morton hasn’t attempted to hide the puppeteers, nor the musicians (Brisbane’s Topology: Robert Davidson, Therese Milanovic, Christa Powell and Composer, John Babbage). Babbage’s score encapsulates dreams and fears, and known and unknown places and people. Argus is a little show with a big heart, fondly known as “the little show that could”. Argus is a gift that keeps on giving to audiences of all ages, moving us beyond words and worlds. On Saturday afternoon I had the pleasure of seeing the talent that the Queensland Conservatorium is pumping out. Their graduating students presented Soundheim and Lapine’s Into The Woods and it was a magical masterpiece. The students had the opportunity to have Kate Wilson direct this production. Her extensive career as a director and academic was obviously very beneficial for the graduates. This shared knowledge is something the students will forever remember and be able to apply in their very bright futures. The performance level of these students is nothing less than what you would expect from Queensland’s premier musical theatre training institution. The talent shone through the smoke effect on stage as the company took us into an imaginative world based on our favourite fairy-tales. The cast had fantastic concentration and focus throughout the performance and the comic timing was perfect. Rehearsing since May this year, the production team pulled together a clean-cut musical for anyone who is a fan of the Grimm stories. The Dead Puppet Society oversaw the design elements of this production; an amazing learning opportunity for these students. It was visible from the mixture of old and new school techniques used in the production that the students had embraced the puppetry elements that were taught. Anyone who knows the musical will agree that the music and lyrics are quite intense and wordy. In some songs the words are being sung so fast you can barely keep up and in others the timing must be so precise between the singers. With this in mind it is no wonder the production team included Soundheim expert Stuart Pedler who shared his knowledge on the talented lyricist. After a bit of confusion as to whether our happily ever after had been cut short or not, we realised it was just interval. Unfortunately a few people weren’t aware of this and didn’t make it back for Act 2. With the vacant seats throughout the audience the lights dimmed and the show went on. I almost turned as red as Jack’s hair when I suddenly heard the familiar Nokia ringtone emitting nearby. After what felt like hours the audience member finally turned it off. Then another audience member decided that the orchestra could be improved by her opening what sounded like every bag of chips from a 20-pack variety box. I was secretly wishing the witch would fly off the stage and turn them into an ugly stepsister or even Milky-white, Jack’s beloved cow. All in all my first Queensland Conservatorium experience was incredible! The connection between the cast members and the powerful vocal work presented could not be described as anything but phenomenal. They have definitely gained a fan. Putting the spotlight firmly on the graduating class of 2014, this is pure talent – exposed! Through blood, sweat, tears and a considerable amount of laughter, this talented group of young performers have worked incredibly hard over the past three years to develop their skills as musical theatre performers. OUR TURN! showcases these students through a delicious taste of the world’s most entertaining and often moving repertoire in vignettes of song, dance and scene in a talent-packed one hour show. Let Queensland Conservatorium’s stars of tomorrow entertain you today! OUR TURN! at QPAC begins the showcase tour. Other cities include Sydney and Melbourne. 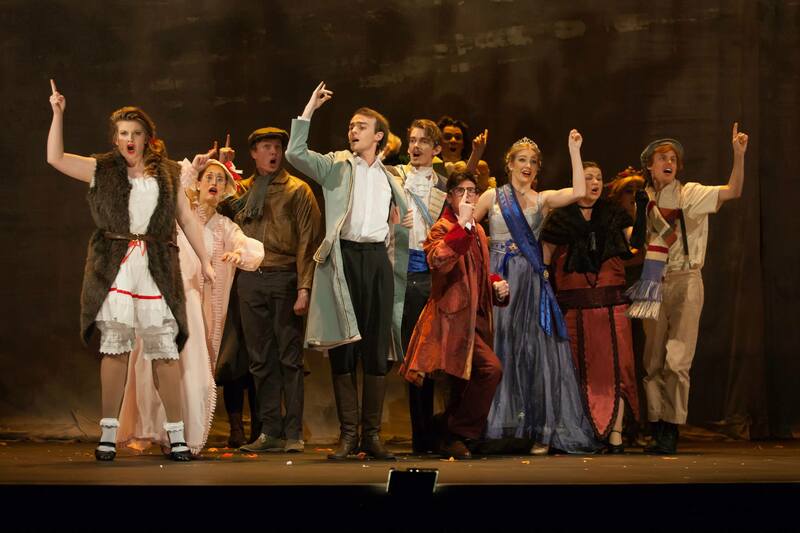 This is a wonderful opportunity to share in the enthusiasm and excitement that has surrounded the Musical Theatre program at the Queensland Conservatorium. Catch a glimpse of Australia’s next Musical Theatre stars! The Dead Puppet Society’s ARGUS – next stop Pittsburgh USA! ‘Four performers, four pairs of hands and one little creature; the littlest of big adventures’ is now a BIG adventure… a somewhat overwhelmingly GIGANTIC ADVENTURE. Formed in 2008, The Dead Puppet Society is an Australian theatre company creating puppet-based, visual theatre. Uniting an old world aesthetic with cutting edge technical elements the company conjure immersive worlds where the mythic sits alongside the macabre, and the old school meets the technological. They have presented work with the Brisbane Powerhouse (Argus 2013), La Boite Theatre Company (The Harbinger 2011 and 2012), Metro Arts (The Timely Death of Victor Blott 2010) and Adelaide Fringe (2009). 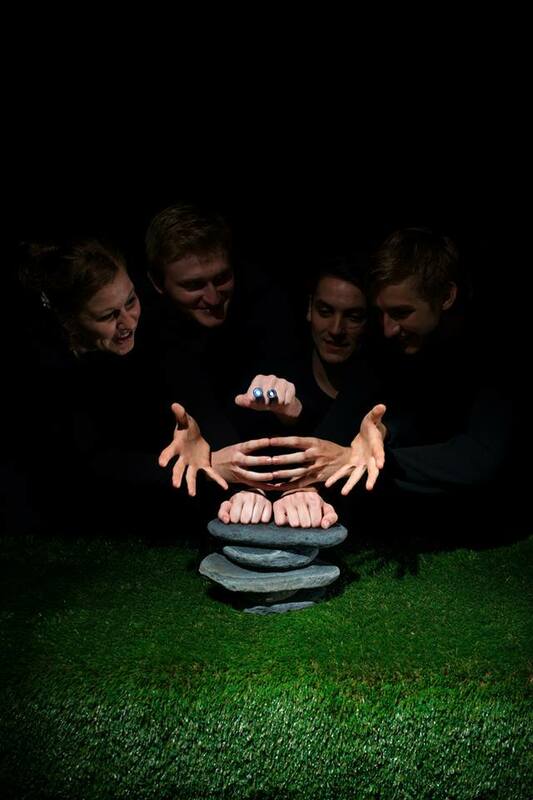 They have recently landed in New York after working with Handspring Puppet Company in South Africa. The story of ARGUS began in 2012 and had its very first life as part of Vena Cava Productions’ Season, with more than thirty student artists from QUT taking part in the initial creation. 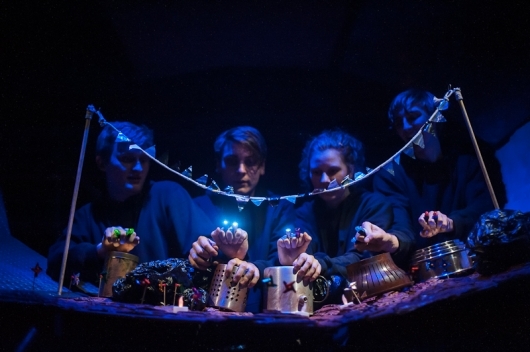 Using nothing but hands and household objects to create miniature worlds on top of trestle tables, the style of performance was simple, magical, and full of potential. Because of the level of imagination it evoked, DPS decided that the work would be perfect as a piece for young people and families, so assembled a killer team including Richard Tulloch (dramaturg), Sandra Gattenhof (creative consultant), John Babbage and Topology (composition) and artists from the Society. It had its professional premiere at Powerkids (Brisbane Powerhouse) earlier this year with the support of the Australia Council for the Arts (JUMP) and will have a showcase showing at Dixon Place in New York City on December 19 2013 thanks to the Jim Henson Foundation and Puppet BloK! curator Leslie Strongwater. DPS always believed in the work, and last week the company was invited to present a Spotlight showing at the International Performing Arts for Youth conference (IPAY) in Pittsburgh, USA in January 2014. The chance to pitch ARGUS in front of a room jam packed with some of the most exciting presenters of work for young people from around the world is too good to miss. DPS want to share the story of Argus, and show off the quality of work being created by students and independent artists in Queensland. But they need your help to get it there! There are 35 days to go!